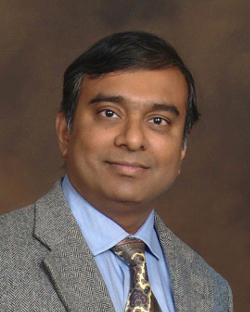 Krishnendu Chakrabarty, the William H. Younger Distinguished Professor of Engineering and professor of computer science, has been at Duke since 1998. 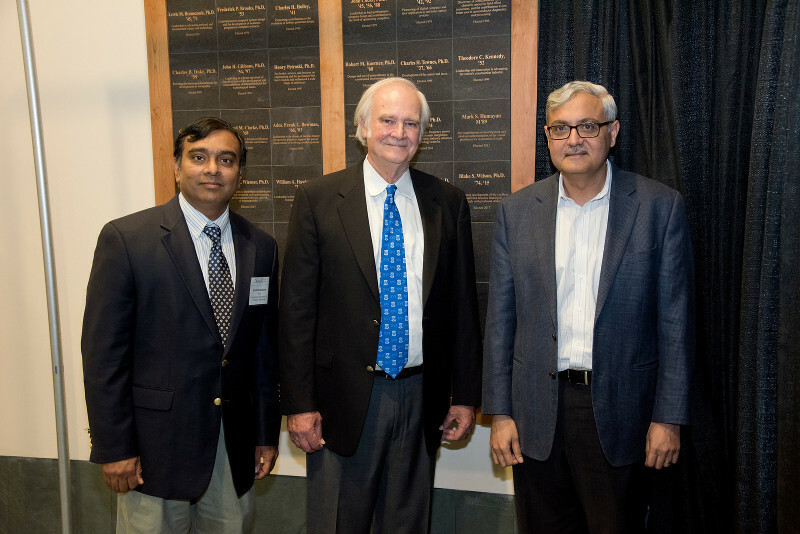 He has performed groundbreaking research in integrated circuit testing and digital microfluidics, among many other areas in electrical and computer engineering, receiving a multitude of honors and awards. Recently, he was appointed as the chair for Duke's Department of Electrical and Computer Engineering (ECE). Chakrabarty's office is a modernistic, minimalist space outfitted with a large desktop computer, a few slanted shelves displaying various engineering textbooks and a small table for visitors. So what journey could have led him to this office? As a young boy in India, Chakrabarty aspired to attend one of the five original prestigious Indian Institutes of Technology. After years of hard work, he gained admission to the Indian Institute of Technology at Kharagpur and proceeded to discover the field of electrical and computer engineering just as the internet revolution was occurring. The revolution brought along never-before-seen innovations such as the World Wide Web in parallel with stunning hardware advancements in microprocessors. "I was hooked, a lot of it because of the times," he said. With new technologies only spurring him onward in his passion for computer science and engineering, Chakrabarty attended graduate school at the University of Michigan, and after a brief appointment at Boston University, he became a professor at Duke in 1998. Now, Chakrabarty has a grand vision for Duke's Department of Electrical and Computer Engineering. "Primarily, I would like ECE to be well-known outside [of Duke]," said Chakrabarty. "We have done really well with the faculty who have come in the last 10 years." Chakrabarty continues by saying he wants to ensure that the department is associated with excellence around the world and plans to implement this in many ways. One of his main points is that in today's world, research is becoming increasingly collaborative between many fields, and therefore the department must branch out and form interdisciplinary ties within and outside of Duke. He is quick to point out that the modern direction of research fosters collaboration even with fields formerly considered to be totally unrelated to electrical engineering, like the relationship between sociology and the development of social networking. To further this goal, Chakrabarty plans to form research teams that weave across different specialties within the department. He offers practical examples of current research into the Internet of Things, robotics and medical devices such as pacemakers. In all aspects, Chakrabarty seems the perfect representative of Duke ECE, bringing together a passion for the field with the desire to continually improve the department that he is now in charge of. Exemplifying this, when asked how the department can assist in solving the National Academy of Engineering's 14 "Grand Challenges for Engineering," he immediately grabbed his laptop and proceeded to explain how ECE can help solve the problems posed, which include such vast tasks as "securing cyberspace," "engineering the tools of scientific discovery," and "advancing personal learning." Chakrabarty is instantly able to pinpoint how the workings of ECE pertain to solving issues in the real world. To Chakrabarty, being the department chair means advocating for the faculty, including their research and advancement within the university, as well as strengthening the relevance of the department to the structure of the Pratt School of Engineering, Duke University and the world in general. He also states that an important priority of his new role is "providing the best training to all students" by continually improving the curriculum that students are presented with. Lastly, Chakrabarty says that he is the external face of ECE, acknowledging his position as another way for him to lead by example. He knows that a large portion of this new task is to be somebody that the students of the department, the engineering school and the entire university can all look up to. All indications from the renowned professor say that Chakrabarty will be able to accomplish these things and more, as he demonstrates an encyclopedic knowledge of his departmental colleagues' research, an obvious commitment to undergraduate education and a willingness to teach. Chakrabarty has developed a strong bond with Duke. He cites Duke's "culture of excellence" and characteristic academic freedom as major assets to the Duke experience, saying, "The pathway that you choose is your own, but Duke expects you to be the best in what you do." He also acknowledges the undergraduates that he encounters throughout Duke as having an ability to "keep him and his mind young." Chakrabarty also enjoys Duke's ability to cultivate the most out of new faculty members, saying that the intensive manner in which new engineering professors are selected breeds these new faculty members to be immediately successful. He notes that since he has been here, the Pratt School of Engineering has only grown, doubling in number of faculty. It is clear to everyone around him that he wishes to be an agent of this expansion in his new role as the department chair. When asked as to the advice that he would give to current undergraduate students, Chakrabarty's response was manifold. Citing his own personal experiences during his undergraduate education, he advised that students "learn for a long time" rather than learn for exams and hone skills in asking questions. He explained that this is an essential skill for conducting research and solving corporate issues alike. He also emphasized the ability to work in teams, a rapidly emerging requirement for engineers worldwide, and the ability to "multiplex"—that is, to pursue many avenues of learning and experience, rather than remaining "unidimensional." As a final note, Chakrabarty advises, "At Duke I have learned that you have to take risks. The payoff is much higher." Now it is Duke's turn to witness the improvements that Chakrabarty will inevitably implement from his well-deserved position at the head of Duke's Department of Electrical and Computer Engineering. Ryan Piersma is a sophomore in the Pratt School of Engineering, double majoring in electrical engineering and computer science.